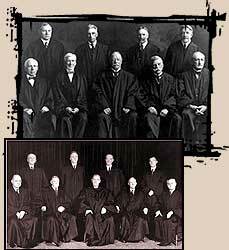 The justices of the Taft Court (1921-30) and Stone Court (1941-46). Jim Crow was a system of segregation and discrimination that barred black Americans from a status equal to that of white Americans. The United States Supreme Court had a crucial role in the establishment, maintenance, and, eventually, the end of Jim Crow. During Reconstruction, the 13th, 14th and 15th Amendments gave black Americans freedom, citizenship, and the right to vote. To further protect blacks from substandard treatment, the Civil Rights Act of 1875 made it illegal to segregate schools, places of public accommodation, modes of transportation and juries. The status of black Americans seemed to be improving during Reconstruction, and the Court seemed to be ready to participate in the process. In 1880, in Strauder v. West Virginia, the Court ruled that restriction of juries to whites only was unconstitutional and violated the rights of blacks as stipulated by the 14th Amendment. Later that same year, however, the same court upheld the conviction of two blacks by an all white jury in Virginia v. Rives. The Court argued that the absence of blacks on a jury did not specifically mean that a black defendant/plaintiff's rights had been denied. This latter decision nullified the Strauder case, and made it clear that whites could find legal ways to discriminate without violating federal law. Blacks had no legal recourse -- if accused of a crime, they would be tried in the absence of a jury of peers. Whites were rarely apprehended, tried, or convicted of crimes against blacks. As long as it could be argued that the state was not culpable, segregation and discrimination went unpunished by the Court. Post-Civil War reconciliation of Northern and Southern politicians meant increasing indifference towards blacks' civil rights and the reassertion of home rule in the South. In 1883, the Court ruled the Civil Rights Act of 1875 unconstitutional, arguing that the right to segregate public accommodations and other public spaces was an individual right, inviolable by law. Justice John Marshall Harlan, the lone dissenter of the case, considered the overturn of the Civil Rights Act as the retraction of equal protection for all citizens under the Constitution. Plessy v. Ferguson (1896) marked the beginning of a 58-year period where Jim Crow was largely unchallenged and condoned by the federal government. Homer Plessy, a black man who tried to board a white-only train in Louisiana (the car designated for blacks was full), claimed the Louisiana segregation laws violated both his 13th and 14th Amendment rights. Once Plessy boarded the white-only train, he was forcibly removed and jailed. The Supreme Court, by a vote of 8-1, ruled that equal rights did not mean co-mingling of the races, effectively legalizing and facilitating "separate but equal" access for blacks. Again, the lone dissenter was Justice Harlan. Plessy not only perpetuated the white supremacist beliefs of the time, but also made it possible for states to make and enforce Jim Crow laws with impunity. In Buchanan v. Warley, the White Court struck down a Kentucky law that enforced residential segregation. Read selected excerpts from the decision.